Wilderness writer Kerasote finds his place in the pack with the help of a sociable dog. While camping with friends along the San Juan River, the author was approached by an emaciated Labrador retriever-mix. Merle, as the stray would come to be named, “looked back to the shore, and let out a resigned sigh—I was to learn that he was a great sigher.” Then he boarded Kerasote’s raft. At journey’s end, the author took Merle home to Kelly, Wyo., a half-mile square of private land nestled among Grand Teton National Park, the National Elk Refuge and the Gros Ventre Wilderness. 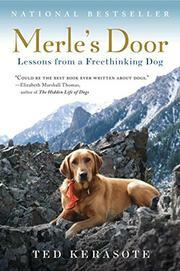 In this rural setting, Merle’s obvious desire for independence led Kerasote to install a dog door: “Why should I treat Merle—who had become the best of friends—like an indentured servant, at my beck and call in return for food and lodging simply because he didn’t have an opposable thumb with which to manipulate the knob on the front door?” Each day, Merle (soon nicknamed “the Mayor” by neighbors) would exit through the dog door and into the heart of the village, eagerly making his rounds. A careful observer with far-reaching interests, Kerasote reflects on everything from canine decision-making to the possible origins of dog domestication to animal consciousness. In this idyllic corner of the West, the two find love (both human and canine) and friendship, forging a remarkable bond that endures until Merle’s death. His passing—and the author’s bereavement—are recorded with Kerasote’s customary discernment. A thoughtful look at animal intelligence and the human-dog connection.